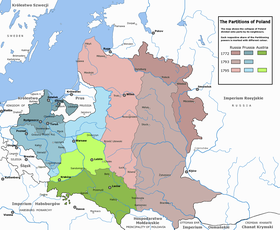 The Partitions of Poland[note 1] were three partitions of the Polish–Lithuanian Commonwealth that took place toward the end of the 18th century and ended the existence of the state, resulting in the elimination of sovereign Poland and Lithuania for 123 years. The partitions were conducted by Habsburg Austria, the Kingdom of Prussia, and the Russian Empire, which divided up the Commonwealth lands among themselves progressively in the process of territorial seizures and annexations. In English, the term "Partitions of Poland" is sometimes used geographically as toponymy, to mean the three parts that the partitioning powers divided the Commonwealth into, namely: the Austrian Partition, the Prussian Partition and the Russian Partition. In Polish, there are two separate words for the two meanings. The consecutive acts of dividing and annexation of Poland are referred to as rozbiór (plural: rozbiory), while the term zabór (pl. zabory) means each part of the Commonwealth annexed in 1772–95 becoming part of Imperial Russia, Prussia, or Austria. In Polish historiography, the term "Fourth Partition of Poland" has also been used, in reference to any subsequent annexation of Polish lands by foreign invaders. Depending on source and historical period, this could mean the events of 1815, or 1832 and 1846, or 1939. The term "Fourth Partition" in a temporal sense can also mean the diaspora communities that played an important political role in re-establishing the Polish sovereign state after 1918. During the reign of Władysław IV (1632–48), the liberum veto was developed, a policy of parliamentary procedure based on the assumption of the political equality of every "gentleman", with the corollary that unanimous consent was needed for all measures. A single member of parliament's belief that a measure was injurious to his own constituency (usually simply his own estate), even after the act had been approved, became enough to strike the act. Thus it became increasingly difficult to undertake action. The liberum veto also provided openings for foreign diplomats to get their ways, through bribing nobles to exercise it. Thus, one could characterise Poland–Lithuania in its final period (mid-18th century) before the partitions as already in a state of disorder and not a completely sovereign state, and almost as a vassal state, with Russian tsars effectively choosing Polish kings. This applies particularly to the last Commonwealth King Stanisław August Poniatowski, who for some time had been a lover of Russian Empress Catherine the Great. 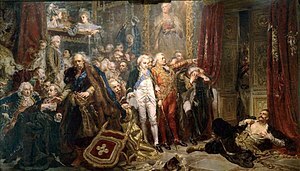 In 1730 the neighbors of the Polish–Lithuanian Commonwealth (Rzeczpospolita), namely Prussia, Austria and Russia, signed a secret agreement to maintain the status quo: specifically, to ensure that the Commonwealth laws would not change. Their alliance later became known in Poland as the "Alliance of the Three Black Eagles" (or Löwenwolde's Treaty), because all three states used a black eagle as a state symbol (in contrast to the white eagle, a symbol of Poland). The Commonwealth had been forced to rely on Russia for protection against the rising Kingdom of Prussia, which demanded a slice of the northwest in order to unite its Western and Eastern portions; this would leave the Commonwealth with a Baltic coast only in Latvia and Lithuania. Catherine had to use diplomacy to win Austria to her side. In February 1772, the agreement of partition was signed in Vienna. Early in August, Russian, Prussian and Austrian troops simultaneously invaded the Commonwealth and occupied the provinces agreed upon among themselves. On August 5, 1772, the occupation manifesto was issued, much to the consternation of a country too exhausted by the endeavors of the Confederation of Bar to offer successful resistance; nevertheless, several battles and sieges took place, as Commonwealth troops refused to lay down their arms (most notably, in Tyniec, Częstochowa and Kraków). 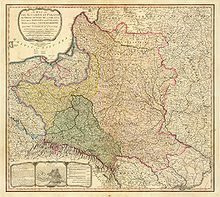 By 1790 the First Polish Republic had been weakened to such a degree that it was forced into an unnatural and terminal alliance with its enemy, Prussia. 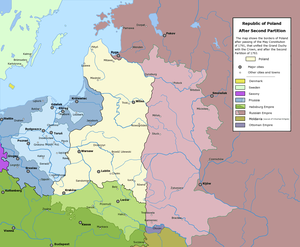 The Polish–Prussian Pact of 1790 was signed. The conditions of the Pact contributed to the subsequent final two partitions of Poland–Lithuania. Kosciuszko's ragtag insurgent armies won some initial successes, but they eventually fell before the superior forces of the Russian Empire. The partitioning powers, seeing the increasing unrest in the remaining Commonwealth, decided to solve the problem by erasing any independent Polish state from the map. On 24 October 1795 their representatives signed a treaty, dividing the remaining territories of the Commonwealth between their three countries. With regard to population, in the First Partition, Poland lost over four to five million citizens (about a third of its population of 14 million before the partitions). Only about 4 million people remained in Poland after the Second Partition which makes for a loss of another third of its original population, about a half of the remaining population. By the Third Partition, Prussia ended up with about 23% of the Commonwealth's population, Austria with 32%, and Russia with 45%. As a result of the Partitions, Poles were forced to seek a change of status quo in Europe. Polish poets, politicians, noblemen, writers, artists, many of whom were forced to emigrate (thus the term Great Emigration), became the revolutionaries of the 19th century, as desire for freedom became one of the defining parts of Polish romanticism. Polish revolutionaries participated in uprisings in Prussia, the Austrian Empire and Imperial Russia. Polish legions fought alongside Napoleon and, under the slogan of For our freedom and yours, participated widely in the Spring of Nations (particularly the Hungarian Revolution of 1848). The Ottoman Empire was one of only two countries in the world that refused to accept the partitions and reserved a place in its diplomatic corps for an Ambassador of Lehistan (Poland). 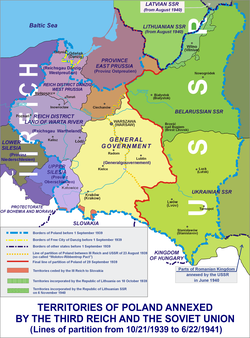 ^ Although the full name of the partitioned state was the Polish–Lithuanian Commonwealth, while referring to the partitions, virtually all sources use the term Partitions of Poland, not Partitions of the Polish–Lithuanian Commonwealth, as Poland is the common short name for the state in question. The term Partitions of the Polish–Lithuanian Commonwealth is effectively not used in literature on this subject. ^ a b c d e f g h i "Partitions of Poland". Encyclopædia Britannica Online. 2008. Retrieved 8 June 2011. ^ Bideleux, Robert; Jeffries, Ian (1998). A History of Eastern Europe: Crisis and Change. Routledge. p. 156. ^ Batt, Judy; Wolczuk, Kataryna (2002). Region, State and Identity in Central and Eastern Europe. Routledge. p. 153. ^ Sinkoff, Nancy (2004). Out of the Shtetl: Making Jews Modern in the Polish Borderlands. Society of Biblical Literature. p. 271. ^ a b c Scott, Hamish M. (2001). The Emergence of the Eastern Powers, 1756–1775. Cambridge University Press. pp. 181–182. ISBN 0-521-79269-X. ^ H. Wickham Steed, A Short History of Austria-Hungary and Poland Archived 2007-09-24 at the Wayback Machine, 1914, Encyclopædia Britannica, Inc. Retrieved on 3 August 2007. ^ a b c Seton-Watson, Hugh (1967). The Russian Empire, 1801–1917. Oxford University Press. p. 44. ISBN 0-19-822152-5. ^ Butterwick, Richard (1998). Poland-Lithuania's Last King and English Culture: Stanisław August Poniatowski, 1732–1798. Oxford University Press. p. 169. ISBN 0-19-820701-8. ^ von Guttner, Darius (2015). The French Revolution. Nelson Cengage. p. 139. ^ Jerzy Lukowski; W. H. Zawadzki (2001). A Concise History of Poland: Jerzy Lukowski and Hubert Zawadzki. Cambridge University Press. pp. 101–103. ISBN 978-0-521-55917-1. Retrieved 8 January 2013. ^ a b Piotr Stefan Wandycz (2001). The Price of Freedom: A History of East Central Europe from the Middle Ages to the Present. Taylor & Francis Group. pp. 133–. ISBN 978-0-415-25490-8. Retrieved 8 January 2013. ^ Davies, Norman (2005). God's Playground. A History of Poland. The Origins to 1795. I (revised ed.). Oxford University Press. p. 394. ISBN 978-0-19-925339-5. ^ Johnson, Lonnie R. (1996). Central Europe: Enemies, Neighbors, Friends. Oxford University Press. pp. 127–128. ISBN 0-19-510071-9. ^ a b Piotr Stefan Wandycz (2001). The Price of Freedom: A History of East Central Europe from the Middle Ages to the Present. Routledge. p. 133. ISBN 0-415-25491-4. ^ Zawadzki, W. H. (1993). A Man of Honour: Adam Czartoryski as a Statesman of Russia and Poland, 1795–1831. Oxford University Press. p. 330. ISBN 0-19-820303-9. ^ Auer, Stefan (2004). Liberal Nationalism in Central Europe. Routledge. p. 60. ISBN 0-415-31479-8. ^ a b Dowe, Dieter (2001). Europe in 1848: Revolution and Reform. Berghahn. p. 180. ISBN 1-57181-164-8. While it is often and quite justifiably remarked that there was hardly a barricade or battlefield in Europe between 1830 and 1870 where no Poles were fighting, this is especially true for the revolution of 1848/1849. ^ Pachonski, Jan; Wilson, Reuel K. (1986). Poland's Caribbean Tragedy: A Study of Polish Legions in the Haitian War of Independence 1802–1803. East European Monographs/Columbia University Press. ISBN 0-88033-093-7. ^ Fedosova, Elena I. (1998). "Polish Projects of Napoleon Bonaparte". Journal of the International Napoleonic Society. ^ Brecher, Michael; Wilkenfeld, Jonathan (1997). A Study of Crisis. University of Michigan Press. p. 255. ISBN 0-472-10806-9. ^ Cygan, Mary (1998). "Inventing Polonia: Notions of Polish American Identity, 1870–1990". Prospects. 23: 209–246. ^ Lopata, Helena Znaniecka (1994). Polish Americans. Transaction. ^ a b Nowak, Andrzej (1997). "The Russo-Polish Historical Confrontation". Sarmatian Review. XVII (1). ^ E.g., Sergey Solovyov's History of the Downfall of Poland (Moscow, 1863). ^ Riasanovsky, Nicholas V. (1952). "Old Russia, the Soviet Union and Eastern Europe". American Slavic and East European Review. 11 (3): 171–188. ^ Hajo Holborn (1 December 1982). A History of Modern Germany: 1648–1840. Princeton University Press. p. 256. ISBN 978-0-691-00796-0. Retrieved 16 February 2012. ^ Nuria Sanz, Dominik Maczynski (2002). "The Prussian Sector In: Guidelines for a Common Inventory". Living Wooden Culture Throughout Europe. Council of Europe. p. 99. ISBN 9287148821. Retrieved 25 March 2013. ^ Prazmowska, Anita (2010). Poland: A Modern History. I. B. Tauris. p. 25. ^ "L'Inno nazionale". Quirinale.it. Retrieved 2013-11-17. Lewitter, Lucjan R. "The Partitions of Poland" in A. Goodwyn, ed. The New Cambridge Modern History: vol 8 1763–93 (1965) pp. 333–59.